Tim O’Brien, founder of Tropical Salvage, was preparing for another warehouse clearance sale of his unique, handcrafted hardwood furniture. It had been an enormously challenging year and it was important to reduce inventory before the next container arrived from Indonesia. The market for fine furniture had begun to decline steadily in early 2008 following the stock market crash of the prior September. The company survived a difficult period, but not without suffering a decline in sales. O’Brien had spent ten years building a sustainable business model based on environmental stewardship, worker empowerment and unique, high quality product. As the economy recovered, O’Brien believed Tropical Salvage needed to pursue an aggressive expansion strategy. Although the warehouse clearance sale was occupying O’Brien’s mind, he was excited about the prospect of implementing a bold growth strategy for the coming years. The two most significant strategies for growth focused on diversifying product offerings beyond hardwood furniture and opening branded retail stores in the United States. Many fundamental business challenges, including brand awareness, financing and operational efficiency, had to be overcome to make these strategies effective. However, O’Brien was confident that the highly vertically integrated structure, unique product designs, cost-competitive sourcing and deeply engrained social mission of Tropical Salvage provided the leverage to overcome these challenges. As O’Brien considered how best to expand, he prepared to markdown the remaining inventory from his last shipment. Are his growth plans overly ambitious while the economy is so uncertain? Does it make sense to extend his product line beyond the hardwood furniture for which Tropical Salvage is known and has experience manufacturing? Is it financially sound to expand into branded retail at this time? Perhaps most importantly, are the trends in ‘conscientious’ consumerism significant enough to support the growth of a values-driven, sustainability-inspired business like Tropical Salvage? This case study was awarded 3rd place in the 2011 OIKOS Global Case Writing Competition - Corporate Sustainability. Copyright © 2010 by the Author(s). This case was prepared by R. Scott Marshall, Lisa Peifer and Erin Ferrigno as a basis for class discussion rather than to illustrate the effective or ineffective handling of an administrative situation. This case is accompanied by a teaching note, available to faculty only. Please send your request to freecase@oikosinternational.org. The authors are thankful for any feedback and suggestions to further develop this case. 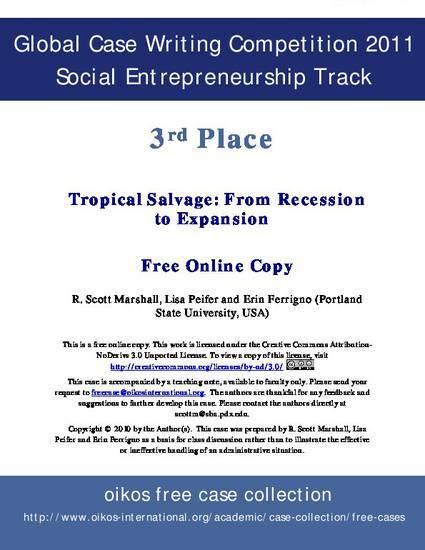 Please contact the authors directly at scottm@sba.pdx.edu.